You're ready to start adding your content and creating your own blog. If you want to have the same. If you want to have the same content on your website as Live Preview of Holomatic theme, you'll need to import demo content. 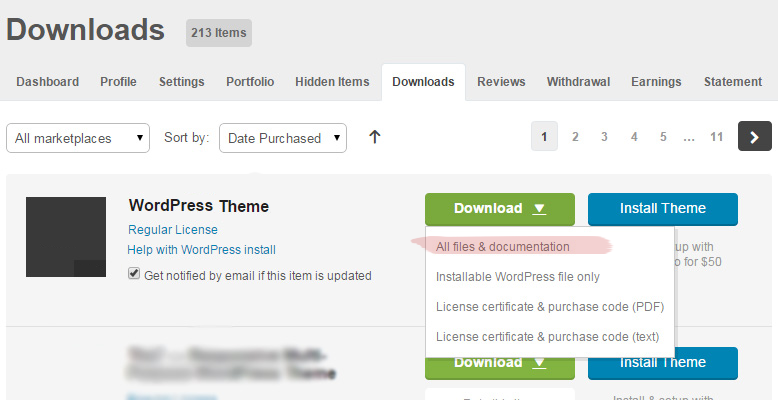 To do that please go to Tools -> Import -> WordPress, install plugin if prompted and then select file "extras/import.xml". You'll find it in "All files & documentation"
All photos included with import file are just plain gray color, as they are copyrighted files purchased on Stock sites and cannot be included in the package. By default the Holomatic doesn't include the demo page templates used in preview - all types of layouts can be configured in Theme Settings - that's done to not over-complicate it and to not confuse users. If you however need to use it to show for example to your client - copy the files from extras/templates/ to your wp-content/themes/holomatic. Without it all the layouts types in Home submenu will be empty static pages. You'll learn how to configure layout in next sections of this documentation. If you've selected import.xml in the Imported, go through each step of the process until you'll see confirmation the process ended successfully. Now you need to setup menu. If your import was successful, please go to Appearance -> Menus and in Manage Locations and for 'Primary Menu' choose "Main Menu", than save.